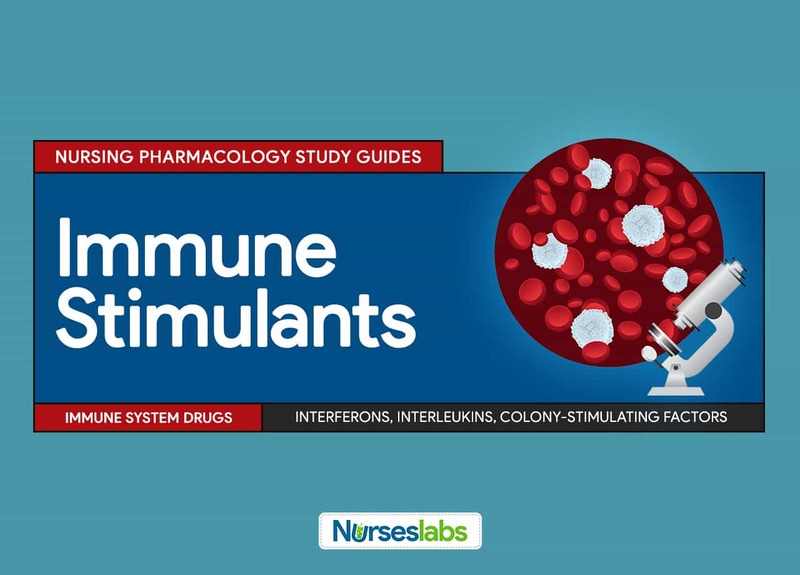 Immunostimulants or immune stimulants are drugs that energize the immune system when it is exhausted from fighting prolonged invasion or when the immune system needs help fighting a specific pathogen or cancer cell. It is one of the classifications of drug class called immunomodulators. Immunomodulators, as the name implies, are drugs that modify the actions of the immune system. The other classification is immune suppressants, drugs utilized to block the normal effects of the immune system in cases of organ transplantation and autoimmune disorders. Immune stimulants include interferons, interleukins, and colony-stimulating factors (utilized to stimulate bone marrow to produce more white blood cells especially for patients at serious risk for infection). Interferons are substances naturally produced and released by human cells that have been invaded by the viruses. They may also be released from cells in response to other stimuli, e.g. cytotoxic T-cell activity. Through the advent of recombinant DNA technology, a number of interferons are now available for use. Preventing virus particles from replicating inside cells. Stimulating interferon receptor sites on non invaded cells to produce antiviral proteins, which prevent viruses from entering the cell. Others include inhibiting tumor growth and replication, stimulating cytotoxic T-cell activity, and enhancing inflammatory response. Interferon gamma-1b also acts like an interleukin, stimulating phagocytes to be more aggressive. Most immune modulators are not recommended for use in children or have not been tested. Exceptions include interferon alfa-2b, azathioprine, cyclosporine, tacrolimus, and palivizumab which should be used cautiously because of their toxic effects on GI, renal, hematological, or central nervous system. Active children should be protected from infection and injury. Emphasize the importance of avoiding exposure to infection. Regular follow-up and medical care should be stressed. Educate about proper technique for injection, disposal of needles, and special storage precautions for the drug. Immune modulators are contraindicated for pregnancy and lactation because of potential adverse effects to neonate or fetus (e.g. fetal abnormalities, increased maternal and fetal abnormalities, and increased maternal and fetal infections, suppressed immune responses in nursing babies). Women of childbearing age should be advised to use barrier contraceptives while taking these drugs. Some drugs may also impair fertility. The aging immune system of this population makes them more susceptible to the effects of immunomodulators. Monitor closely for GI, CNS, renal, and hepatic toxic effects. Extensive health education on avoiding infection and injury is necessary. Allergy to any interferons or product component. Prevent hypersensitivity reaction. Pregnancy and lactation. Potential adverse effects on the neonate or mother. Cardiac disease. Hypertension and arrhythmias have been reported with the use of these drugs. Myelosuppression. These drugs may suppress the bone marrow. Central nervous system (CNS) dysfunction of any kind. Potential for CNS depression and personality changes have been reported. There are no reported clinically important drug-drug interactions with interferons. Interleukins are synthetic compounds that communicate between lymphocytes, thereby stimulating cellular immunity and inhibiting tumor growth. Interleukin-2 stimulates cellular immunity by increasing the activity of natural killer cells, platelets, and cytokines. Increasing the number of natural killer cells and lymphocytes, cytokine activity, and circulating platelets. Allergy to any interleukins or E-coli-produced product. To prevent hypersensitivity reactions. Pregnancy. These drugs were shown to be embryocidal and teratogenic in animal studies. Lactation. Potential adverse effects to the baby as it is not clear whether drugs can cross into breast milk. Renal, liver, cardiovascular impairment. Adverse effects of the drug. Oprelvekin has been associated with severe hypersensitivity reactions, and patients should be instructed to report difficulty breathing or swallowing, chest tightness, or swelling. There are no reported clinically important drug-drug interactions with interleukins. Colony-stimulating factors are produced by recombinant DNA technology. These drugs can increase production of neutrophils and can activate mature granulocytes and monocytes. Increasing the production of white cells. Sargramostim is contraindicated in neonates because of benzyl alcohol in the solution and with excessive leukemoid myeloid blasts in the bone marrow or peripheral blood which could be worsened by the drug. Caution is also used in patients with hepatic or renal failure which could alter the pharmacokinetics of the drug. Pregnancy and lactation. Effects on the fetus or neonate are not known. Lithium or corticosteroids. Sargramostim’s increase in myeloproliferative effects. Assess for contraindications or cautions (e.g. history of allergy to the drug, pregnancy and lactating status, hepatic, renal, or cardiac disease, leukemic states, etc.) to avoid adverse effects. Monitor laboratory tests like CBC and renal and liver function to determine the need for possible dose adjustment and to identify changes in bone marrow function. Monitor for severe reactions, such as hypersensitivity reactions, and arrange to discontinue the drug immediately if they occur. Arrange for supportive care and comfort measures (e.g. rest, environmental control) to help patient cope with drug effects. Monitor for adverse effects (e.g. flu-like symptoms, GI upset, CNS changes, bone marrow depression). This is a substance released from cells in response to cytotoxic T-cell activity. Interferons are substances naturally-produced and released by human cells that have been invaded by the viruses. It can be released from cells in response to other stimuli, such as cytotoxic T-cell activity. How do interleukins exert its therapeutic benefits inside the body? All other options are actions of interferons. Most can be safely recommended in children. Infection control is an integral part of drug therapy. Interferons and interleukins have many drug-to-drug interactions. Patients on immune modulator therapy should be protected from injury and infection. Regular follow-up and medical care should be stressed. Other adverse effects include bone pain, GI upset, dermatitis, and fatigue. Which immune stimulant is usually used for treatment of blood-related cancers? Interferons are usually indicated for hepatitis C, Kaposi sarcoma, and AIDS-related complex. Interleukins are usually for renal carcinomas and severe thrombocytopenia. 1. This is a substance released from cells in response to cytotoxic T-cell activity. 2. How do interleukins exert its therapeutic benefits inside the body? A. Most can be safely recommended in children. B. Infection control is an integral part of drug therapy. C. Interferons and interleukins have many drug-to-drug interactions. 3. Answer: B. Infection control is an integral part of drug therapy. 5. Which immune stimulant is usually used for treatment of blood-related cancers?